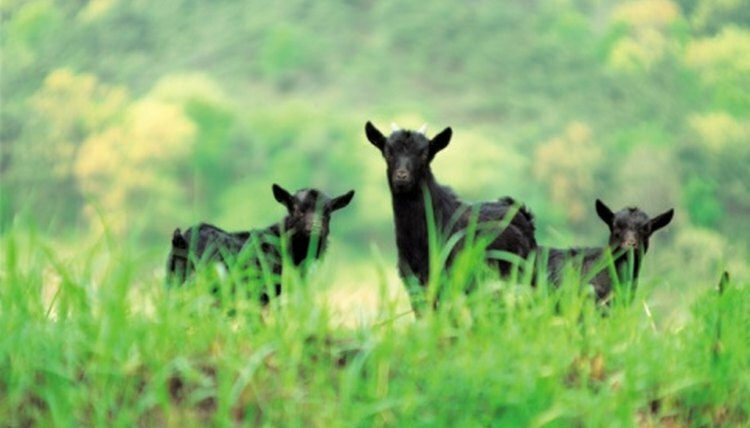 Goats play an important role in eradicating invasive plant species in an environmentally friendly way. The goat first destroys the plant by pawing and ingesting the flower, stem and leaves of the plant. An enzyme in the goat's saliva then kills the seed of the plant to prevent future re-seeding. Goats have a reputation for being willing to eat anything. However, there are a few plants that goats will not eat. Wild sage, also known as Lantana camara, is a shrub which can grow up to 10 feet tall and is found in tropical locations. The plant comes in three flowering varieties, red, white and pink. The red-flowering variety is generally most toxic. Wild sage is mostly avoided by goats unless they are hungry and undernourished. The plant is poisonous to goats and other livestock if ingested. A veterinarian should be called immediately if you believe your goat has ingested any variety of wild sage. Cogongrass (Imperata cylindrica) is considered a noxious weed and is found growing in many states, mostly in the Mid-South and Southeast. Goats avoid cogongrass because of the bitter taste caused by high silica in the mature plant. The young cogongrass plant has a sharp leaf point that discourages ingestion. Salal (Gaultheria shallon) is a sought-after plant in the floral industry and grows in the Pacific Northwest; goats will leave it untouched. The glossy dark green leaves are used as greenery in many plant arrangements. Russian knapweed (Acroptilon repens) is an invasive weed that grows mostly in the Western United States but originated in Europe and Asia. Russian knapweed is mostly avoided by goats, unless they are undernourished. Oregon grape (Mahonia aquifolium) is a native plant to the Pacific Northwest. The herb is prized for its medicinal qualities. Goats avoid Oregon grape due to its sharp spine and leaf edges as well as the bitter, astringent taste. Mullein (Verbascum thapsus) is a medicinal herb that grows in the eastern parts of North America. Mullein, as well as nightshade, are plants that goats will not eat, even when starving. Nightshade (Atropa belladonna) is a poisonous plant that can grow up to 5-feet tall. When the plant is stepped on, it gives off a bad odor, and the taste is bitter. Based in Richmond, Virginia, Ashley Baker has been writing helpful articles since 2007 with an emphasis in health and fitness as well as home and garden. Baker attended John Tyler Community College for nursing. Are Carnations or Pansies Poisonous to Cats?